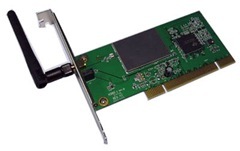 The Newlink PCI Wireless Card operates to the IEEE 802.11g connection standard and has WPA and WEP Encryption security and connects at speeds up to 54 Mbps, with distance ranging from 50 - 100 Mtrs, depending on location and surrounding environment, it is backwards compatible with IEEE 802.11b. Driver supports Windows 98SE, ME, 2000 & XP. Texas Instruments TNETW1130 wireless chipset.